Summer is barking at the heels of spring and warm weather is here to stay . . . for a while. Yippee! Once summer makes an appearance, it’s all about fresh, seasonal fruits and veggies in my kitchen. When I’m making out my weekly spring and summer menus, light and bright becomes the focus of my meal planning. Most of our summer meals are cooked on the outdoor grill and we turn to no-bake desserts. Cleanup seems to be easier too. 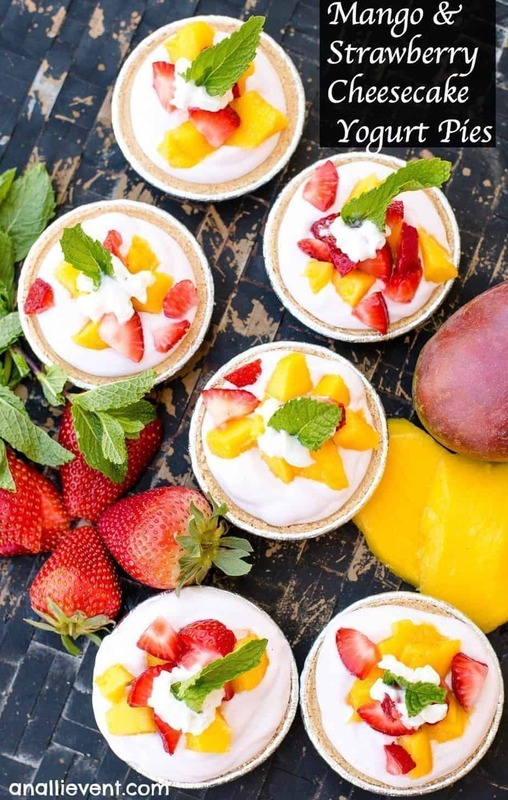 No-bake Mango and Strawberry Cheesecake Mini Pies are filled with a creamy, light, strawberry cheesecake Greek yogurt-based filling and topped with fresh fruits and mint. You can’t get any better than this. 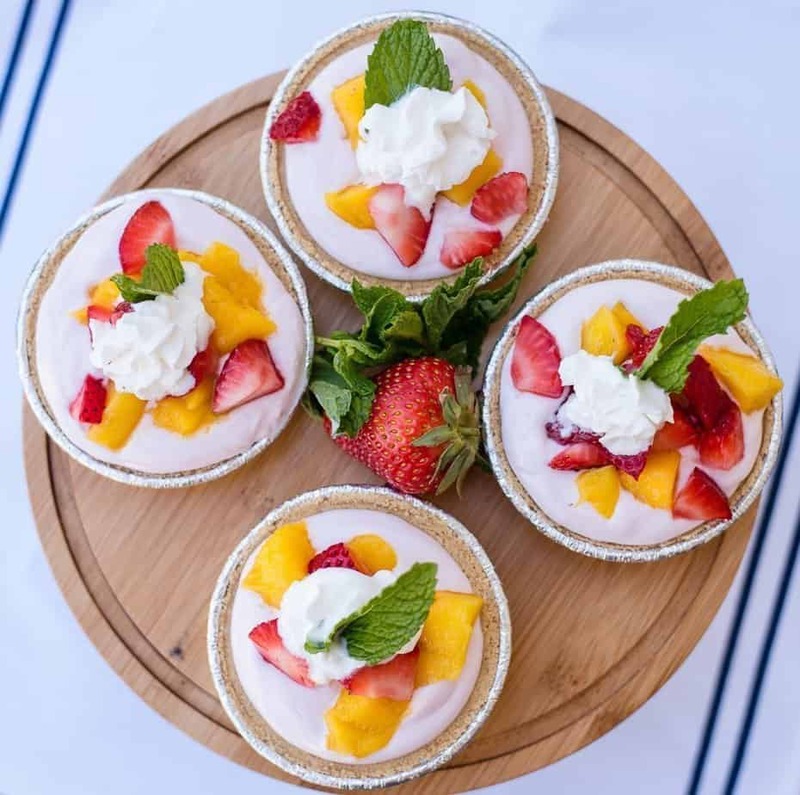 Whether I’m entertaining guests at a summer cookout or it’s just the family, my Mango and Strawberry Cheesecake Mini Pies are always a big hit. Seems my son and I aren’t the only ones who crave our own individual dessert. As your guests ooh and aah over your beautiful fruit topped mini pies, you don’t have to tell them how easy they are to make. Of course, once your family and friends ask for the recipe, you’ll have to fess up to how effortless these pies are. Walmart is the place to buy all your baking needs. Keebler® Ready Crust® Mini Graham Cracker Pie Crusts are in the baking aisle. My son always enjoys having his own individual dessert. I have to admit that I like it too. I don’t have to share with anyone. It’s all mine. 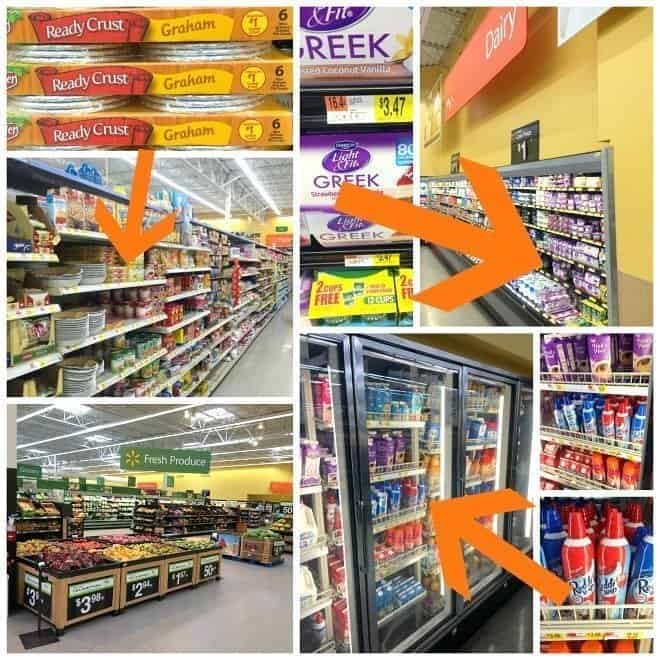 Before leaving Walmart, I also grabbed Dannon® Light & Fit® Strawberry Cheesecake Greek Yogurt and Reddi-wip®. Then I headed to the produce department for fresh mangos, strawberries, and mint. Helpful Hint: A ripe mango will give slightly. Just like peaches or avocados, mangos become softer as they ripen. Ripe mangos will sometimes have a fruity aroma at their stem ends. Don’t go by color. The red color that appears on some varieties is not an indicator of ripeness. Peel mangos from top to bottom. I use a use small paring knife, but you can use a y-shaped peeler as well. Then I slice the mango from top to bottom, circling the pit until all the flesh is removed. At this point, after inhaling the aroma of fresh mangos, you’ll want to take a minute and eat a few slices. Hold your horses – they taste even better on top of the pie. You only need six ingredients to make my no-bake pie. 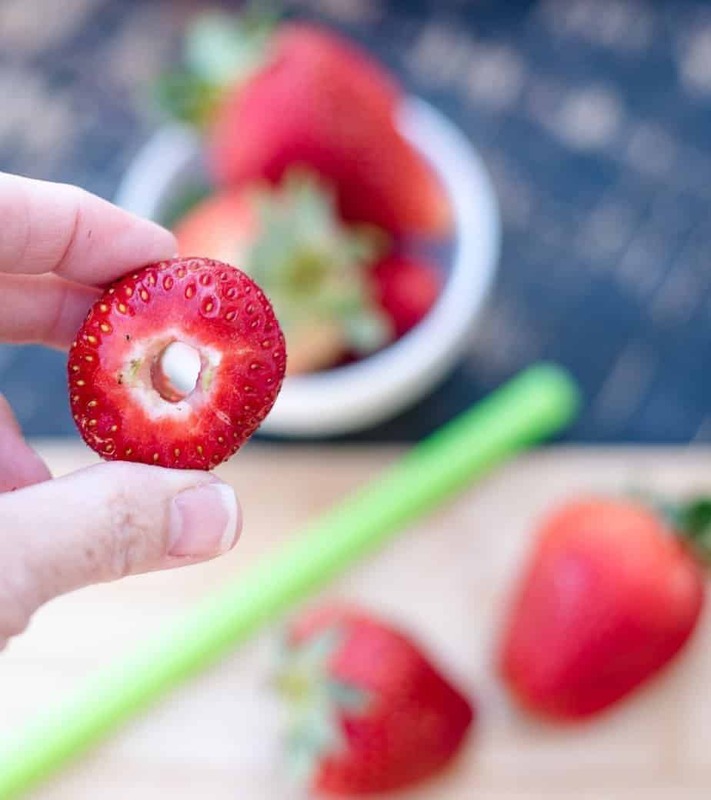 Hull strawberries and slice into quarters. Peel and dice the mango. Set aside. At this point, you can add a teaspoon of your favorite sweetener, but I find that the fruit is sweet enough as is. Helpful Hint: To hull strawberries, I use a plastic drinking straw. 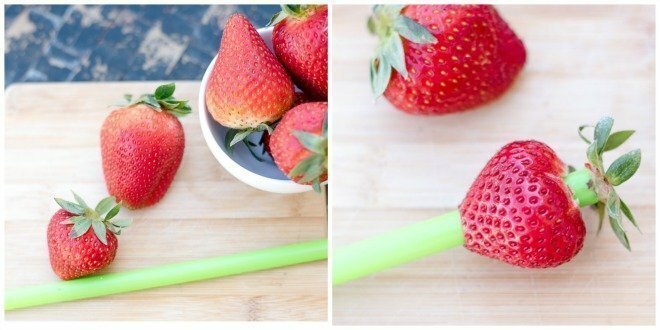 Insert the straw into the small end of the strawberry and push through to the stem end. Spoon the filling into the Keebler® Ready Crust® Mini Graham Cracker Pie Crusts. Top with mangos and strawberries. Garnish with Reddi-wip® and a mint leaf just before serving. Or you can finely chop the mint leaves and add them to the fruit mixture. There are several different options for serving Mango and Strawberry Cheesecake Yogurt Mini Pies. You can serve them immediately or place in the fridge for a few hours. You can also freeze them and let thaw a few minutes before serving. These pies are effortless, easy and they taste delicious. Want a bite? It’s as easy as pie and the kids would love to help with this one. 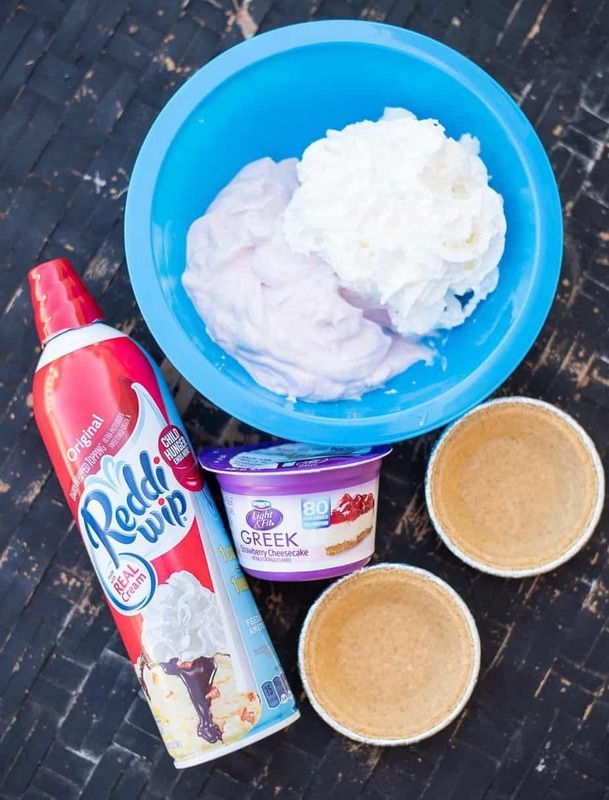 Combine the yogurt and the same amount of Reddi-Wip® in a medium bowl. Fold gently to combine. Spoon the yogurt mixture into the pie crusts. Top with chopped strawberries and mango. 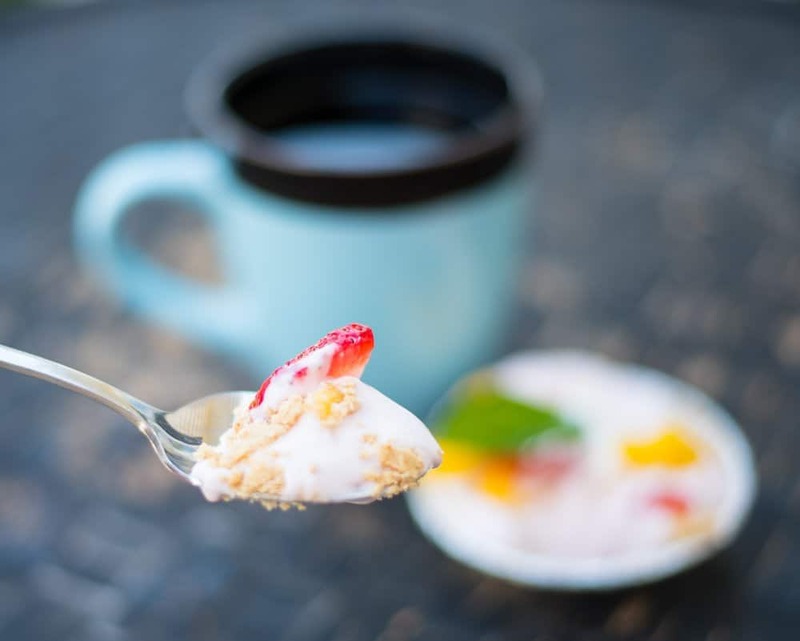 Garnish with Reddi-Wip® and mint leaves. These sound wonderful! I love dessert ideas like this in the summer. They are light and refreshing. WOW! I love mango and strawberry, and never would have thought to create something so yummy with them! These look like the perfect treat for dessert after a BBQ this weekend! Oh my gosh what an amazing combination of flavors!! This would be the perfect dessert for a BBQ! These look like a delicious way to have a little indulgent snack for sure. Cheescake is the perfect way to sneak in some deliciousness into your day! These sound so good. Mangoes are my son in law’s favorite fruit so I know he would love these. My daughter would love these. Pinning so I can recreate it soon. Thanks! I love mini pies- their small size just makes them so cute! The combination of strawberry and mango sounds so delicious. This is something I’d love to try! These pies look absolutely adorable and great for Spring and Summer entertaining. I love how simple they are to make but they present like such a fancy and complicated dessert–genius! Fabulous tips. Never new a drinking straw could be a kitchen tool. These little pies look delicious. They’d be perfect for Memorial Day weekend BBQs. 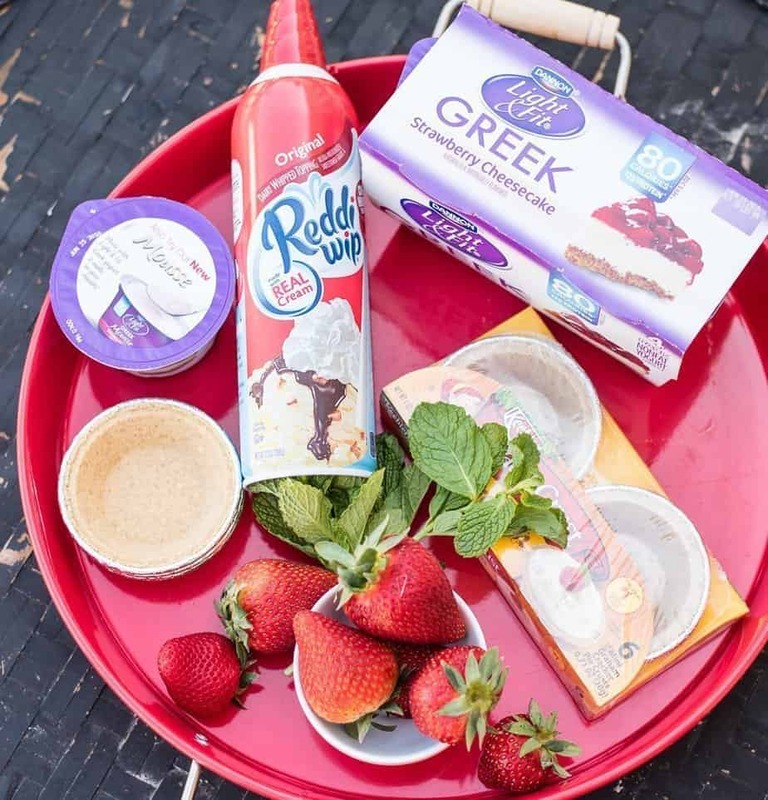 Perfect desserts to enjoy all summer long! I’m with your son, I want my own! And yes I am oooing and ahhing right now! Pinning too. Awesome, love the simplicity! These sound absolutely delicious, I am obsessed with all things mango lately. 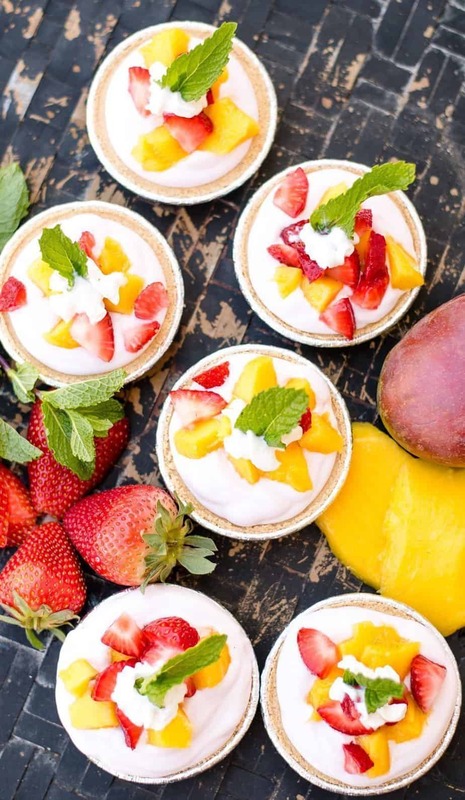 These mango and strawberry cheesecake mini pies are a great dessert choice for any gathering. I know my family loves cheesecake and this would be a great dessert idea they would so love. Thanks for sharing the recipe. Oh my goodness! I need to make these right now, that looks so so amazing! I just love mango! These look so yummy! I love fresh mango. I bet these would be the perfect after dinner dessert this summer! Echo recently posted…I Spent Most Of Mother’s Day Without My Kids And I Loved It! Oh my goodness these look wonderful! I love cheese cake! These looks so yummy. I want to make some right now. I have everything except the mangos. This is my type of snack. Anything with graham cracker crust is is my favorite. I will definitely try this out. Thank you for sharing. This looks so so tasty! I’m loving all of this and I will make this for my family!! !